When I first started dating my boyfriend, we made a chocolate layer cake, or he did rather. 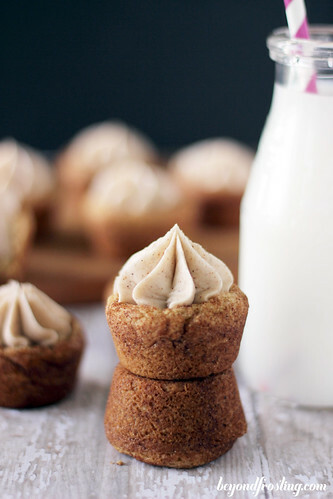 The next thing we baked was a box of snickerdoodles. This particular brand was the closest snickerdoodle he could find to his favorite childhood recipe. Yesterday was the first time he actually made the recipe from scratch. I am writing this post as I anxiously wait for the first batch to come out of the oven. He made the entire batch himself and only called me to ask me where a few ingredients could be found. 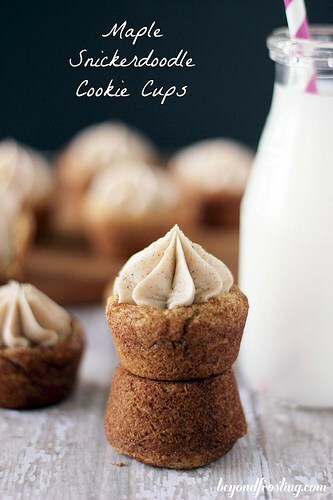 When we finally got a copy of the recipe, I was super excited; all he used to talk about was this snickerdoodle cookie. 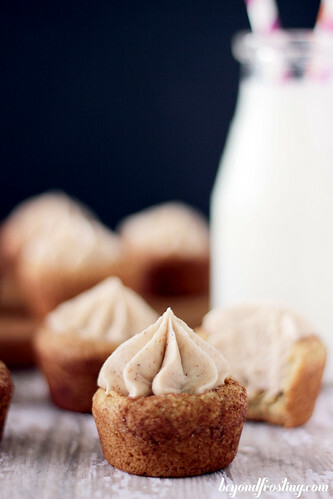 So I took his original recipe and changed around a few of the ingredients to make these Maple Snickerdoodle Cookie Cups. 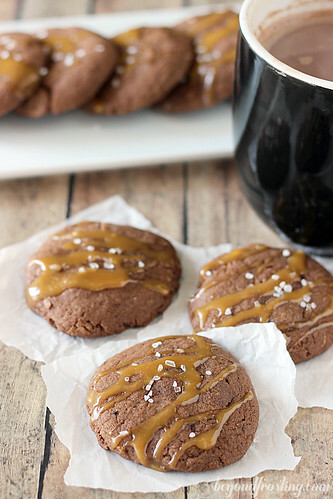 I’ve had a jar of maple sugar in my pantry for quite some time and I’ve been dying to make something with it. I made the first batch and they were fantastic but totally flat. However, I didn’t have enough maple sugar for a second batch. So I went on a quest to find more. Turns out it’s super expensive. So I decided that I needed to change the recipe to be more user friendly with maple syrup. I also used brown butter because I liked the nuttiness of the brown butter. 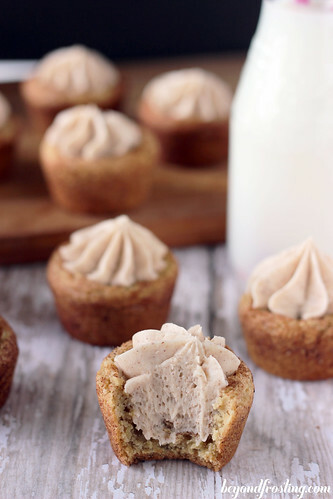 I topped these cookie cups with a fluffy maple cinnamon frosting. I love the little dollop of frosting on top. This is one of those cookies that I can’t keep at the house. I had to give away all my extra cookies because I could just keep eating them all day. I am very pleased with my first homemade snickerdoodle recipe! 1/2 C Unsalted butter, browned. Preheat oven to 375° and coat mini muffin pan with cisco or with a light spray of cooking spray. Brown butter in a sauce pan over medium heat. Once butter is melted, stir constantly until butter turns light brown and starts to have a nutty aroma. Combine browned butter with sugar and light brown sugar and beat on medium speed until well creamed together. Add egg, vanilla and maple syrup. Mix into butter and sugar until egg is well beaten. In a separate bowl, combine flour, baking soda and cream of tartar. Slowly add into batter and beat on medium low speed until well combined. On a small plate, combine sugar and cinnamon and stir to combine. Measure out about two tablespoons of dough. Roll into a ball and then roll in cinnamon sugar mixture. 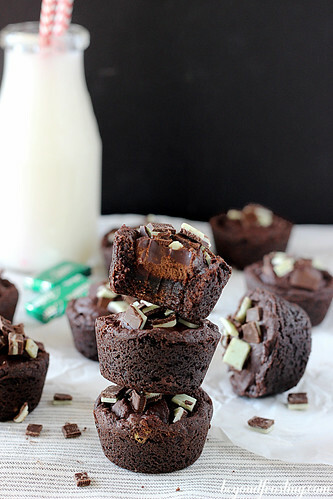 Place into a mini muffin pan. Bake at 375° for 10-14 minutes until they turn light brown. Remove from oven and allow to set for 5-10 minutes. Use a tart shaper and gently press into the center of the cookie to form a cup. Allow cookies to set for another 10 minutes before removing from muffin tin. Allow to cool completely. Lastly, add maple syrup and cinnamon and beat until incorporated. 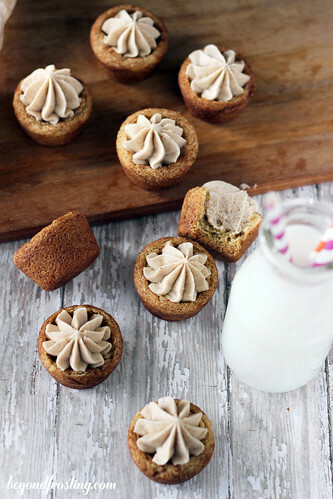 Fill cookie cups with frosting once cookies are cooled. Make sure to enter the giveaway from Monday’s post!! 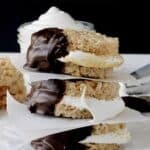 Is there any substitute I can use instead of heavy whipping cream? Please let me know. Thanks! Hi Annie, you can try using milk for the frosting instead.